We also offer high security master keyed suites and keyed alike systems, from Kaba expert security locks to euro spec MP10. We can offer something to suit every budget. The UK Home Office recommends fitting five-lever mortise locks to all external doors and many insurance companies require this as a minimum requirement. Mortice locks have several lever variations: a 2, 3, 5 or 7 lever mechanism. 5 lever and above can be British Standard or non British Standard. The higher the number of "levers" the more difficult the lock is to "pick" and the more secure it will be. The higher the number of levers the lock has the more key variations there are eliminating duplicate keys. We recommend all locks should be upgraded to a 5-lever lock, tested to BS3621:2004, which can be identified by the British Standard Kitemark symbol. This is usually a minimum insurance requirement. 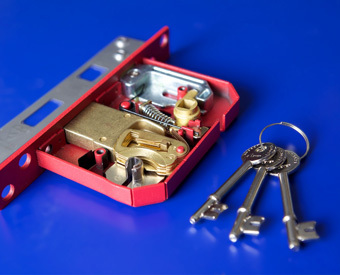 Mortice locks require a key to be turned to activate the deadlock. The major advantage of a mortice lock is that burglars cannot smash an adjacent window, reach inside and unlock the door. The deadlocks on a mortice lock also mean that if a burglar breaks in through a window they cannot escape through the door, providing you have not left the key in the lock on the inside. We will replace cylinders with lock cylinders of at least like-for-like quality, preferring to upgrade to a more secure high quality lock where necessary. In instances where keys have been lost or stolen, we would only change the cylinder of the lock. We recommended the fitting of mortice locks to supplement cylinder rim locks, particularly on front doors. Most PVC doors are locked in multiple positions by the lift of a handle and the turn of a key. When lifting the handle you are opperating a multi point door strip which will seal the door. When turning the key you are opperating a euro cylinder which will phisically lock the door. Both of these mechanisims can be opened repaired or replaced. PVC doors meet most insurance requirements, however we would advise changing your Euro cylinder to a restricted or a 6 pin security cylinder. We can also fit additional security such as door chains or bars. Please contact our team for a free no obligation quotation.